BBC News - Cat Watch 2014: What’s it like being a cat? Cats are at a crucial point in their evolutionary journey as they transform from solitary hunters to domestic pets, a study by the BBC and the Royal Veterinary College has revealed. Our felines are adapting quickly to life in densely-packed cities, changing their behaviour to fit in with our 21st Century lives. They are time-sharing territory with other cats, killing less prey and learning to communicate with each other and people, research for BBC Two's Cat Watch 2014 found. In the first of a three-part series on the lives of modern domestic cats, we look at how our pets experience the world. Cats' highly-developed senses, honed through millions of years of evolution, make them highly efficient predators. In fact, our pets interact with the world in a very different way to us. Cats see the world in muted colours, making it easier for them to see movement without distractions. They also have large eyes for their size, allowing them to see well in low-level light. However, they can't focus on anything less than a foot away, so use their whiskers for detecting objects closer to their bodies. Cats are the gymnasts of the animal world. They can scale vertical walls, negotiate the tops of fences and, if they stumble and fall, are able to land on their feet. The reason for their athletic abilities is their unique skeletal structure. Their crouched posture enables them to move stealthily and silently as well as to absorb the shock of falling from a height. In addition, their spring-like back legs can propel them forward and upwards at speed. Watch humans and cats attempt to locate the origin of ultrasonic sounds. Cats have huge ears which can rotate independently of each other - moving up to 180 degrees. They also have a huge number of neurons between the ear and the brain helping to decipher information quickly. Their inner ear is constructed slightly differently from ours, meaning they can hear a larger range of sounds than many other mammals. They can detect 11 octaves in total - two octaves more than a human being - helping them track small creatures communicating in ultrasonic squeaks. A cat's sense of smell is at least 100 times better than ours and it is able to distinguish between thousands of odours. 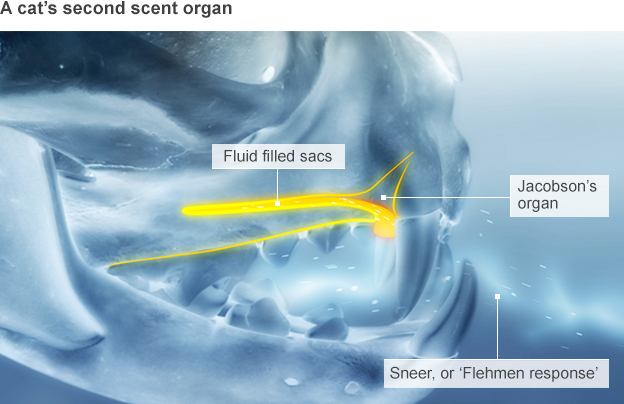 A feline nose contains small scrolled bones covered in hundreds of millions of receptors which quickly pick up all the scent information and take it to a highly-developed part of the brain for processing. Cats also have a secondary, hidden scent organ above the roof of their mouths - exposed when they "sneer" - to detect odours in the air they breathe in. You can also try out three interactive videos, featuring footage of newborn kittens, a cat on a hunting expedition and city cats competing for territory. The Mammal Society is mapping the distribution and density of cat populations across the UK. To take part in the survey, visit the Mammal Society website and fill in the online form. With thanks to Professor Alan Wilson of the Royal Veterinary College, Dr John Bradshaw and Dr Rachel Casey of the University of Bristol, Dr Sarah Ellis of the University of Lincoln, the residents of Hanover Street, Brighton, the villagers of Rottingdean, Sussex and farmer David Hicks. Written and produced by Lucy Rodgers. Design by Laura Cantadori. Development by Christopher Ashton and Nzar Tofiq. Bhasker Solanki photographed commuters on an early morning train from Surat to Mumbai. Campaign posters warn women not to inflict smoke on their unborn children.